We're mobile again and pausing in Winslow, Arizona, after fixing our fuel filter problems. 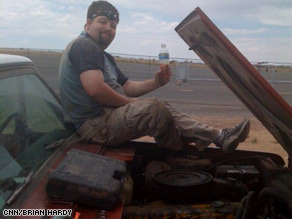 Cody takes a break from road-side repairs. After a late night getting the Scout freed from its confines on the road out of Grand Canyon West, we slept in a little and had a nice big breakfast at Denny's. We then set out on our daily errands and attempted to get the Scout back up to road-trip condition. Our main task was to get the fuel tank pumped clear of all of the various substances and residues we'd put in it over the past 1,200 miles. We first tried calling various repair shops and truck stops, to no avail. Then we were directed to Great West Truck Center, a large semi truck service shop that was right there in town. Thanks to the help of Steve and Debbie at Great West, we were able to get the tank pumped with a minimum of hassle. Apparently what was in there smelled a lot like acetone and had a very strange consistency - prime for clogging things! With that taken care of, we headed across the way to the Flying J to fill up some good old harmless No. 2 diesel, and used their parking lot as a makeshift shop to switch out our tank. After a quick priming of the system, we were up and running comfortably. Success! Then it was time to clean the two-and-a-half days of desert dust out of the Scout's interior. We also took the opportunity to change the air filter and the oil, which, from the look of its filter, was something we should have done already. Everything went fairly smoothly here, and the Scout seems much happier for it. We then had some very delicious Mexican food at Alphonso's as a last stop before leaving Kingman and heading to Winslow. Our original plans were to go to Taos, New Mexico, over the weekend, but due to our unexpected troubles we had to cancel those plans and push it straight to Roswell - voted on by CNN.com users among three other choices (ironically including Winslow). Our stop in Winslow is basically aimed at cutting our drive time into more manageable chunks. We'll see you Monday at 9:40 a.m. on CNN.com Live, when we'll show you the odd way we rigged the fuel line to get us out of the Grand Canyon. Well, you did make it to Winslow AZ after all. Was a girl, my Lord, in a flatbed Ford, waiting to welcome you . . . or at least slow down to get a good look? Great job Cody! I know that it's frustrating having to fix a major problem with limited resources. Steve and Debbie must be great folks. Keep on trucking and don't let the negative posters get the best of you. They just want to spend $40,000 on their vechicle so they can have more time for video games, lattes, and McMansions... none of which they can afford. Good posts by Dieselscout Mike and Biodieseljeep, they were right on lots of things. There's a whole Scout community cheering for you guys, keep on Scoutin'. How could this be ? Was the clogging of the arteries due to Chicken fat ? Vegetarian Biofuelers allowed to recycle the waste of serial Chicken killers ? Cody, I can almost feel your sigh of relief! What a blessing to have people along the way to give a helping hand, and blessings for them too..to have their buisness recoginzed. It's a Win Win for all. I am watching closely, your role modeling is a great destressor for those of us that are considering converting over to diesel. It helps to have all the info. Love to see the focus on alternate fuels. Have you investigated Valcent's green-house produced algae as biofuel? And, I understand a utility company in Arizona or New Mexico is developing a green house like the valcent's. Your ongoing adventure reminds me of a similar expedition I had in the year 2000. I was picking up an "Ebay" Scout body tub with my Diesel Scout pulling a flatbed car trailer. I'm from Iowa, and the Scout body was near Las Vegas. I-70 through Colorado, scenic though it was, was not the route for a loaded trip back. I opted for I-40 through AZ and NM, then northeasterly after that. The Scout started overheating while coming through Albuquerque, and I pulled over at a filling station. The upper radiator hose had blown, and there were no parts stores open. I contacted someone who knew someone, who was online with someone else, etc, etc, and there was a Scout owner living close to where I had broken down. He removed the upper hose from his driver Scout in his garage and brought it to me. This took place in about 1 hour's time. After returning home successfully, I bought new hoses for my rig, and shipped a new hose to the lender of my "emergency" hose. The helpfulness of Scout owners is something unusual in this day and age. I'm happy to say that I'm a member of that group. As always, good luck and happy travels. I helped a friend build a 392 powered Scout to go from Florida to Alaska where his new job was going to be. On the road trip, the 392 over torqued the Dana 44 rear end and he had to leave the truck in Idaho. He had it towed to an International dealer that hadn't seen a Scout in 15 years. Some of the guys there were previous Scout owners and worked with him on the parts, basically gave him the labor to build him a tougher rear end and he was able to get her to Alaska a short time later. Scout owners are friendly, and so are the other folks that have helped Cody and Brian in Arizona. Middle-America people are the best. Do you think folks would have done the same thing had his problem happened in California or somewhere on the East coast? I'm thinking about meeting up with Cody and Brian when they head through Texas. That's about as close as they'll be getting to me here in Oklahoma. If you want to come down, mike, I'll put you up on the farm. It sounds like you're having a great adventure. I like the the idea of using biofuels in a classic vehicle. It has the feel of a grass roots movement. But If you had a new electric (or partially electric) vehicle with a solar charger and plug in you'd probably be home by now! An electric vehicle would be much cleaner than any biofluel vehicle and the emissions from producing the electricity could be treated more easily at centralized locations (energy plants). It doesn't have to be this difficult to drive alternative fuel vehicles. People do it all the time. This reminds me of the american car manufacturers who have fallen behind the times. Clean electric or possibly natural gas vehicles with long distance capability – that's where its going. Get on board with the future of transportation or prepared to get run over. As you may have guessed by now, I'm the one with the "Last Scout". You may have seen it at the "Centennial" last year. BUT...we prepared in advance. We had a VW dealer do a pre-sales inspection...the Ford dealer we bought it from put all new tires on...we plotted out BioDiesel stations along the way, and called them to find out their days/times of operation (and to make sure they were open to the public)...we also plotted out VW dealers along the way, just in case we did have mechanical problems. We asked the dealership to make sure the tank was half full, so we could drive straight to a local station and fill with BioDiesel. We started out using B2-B5, then B20, then B50, and I believe we ended on B5. We didn't have a single problem, never even had to change the fuel filter. We wish you the best Cody, if your ever in California again, we would be happy to buy you a nice lunch...and fill up your vehicle for free with B99 BioDiesel (we buy it from a station in San Diego...RTC). Hopefully by then you'll be driving a 2009 VW Jetta TDI, and getting 55-60mpg...oh and they don't cost $40K either...just $23K. BoiDiesel is definitely the way that our nation should go. The problems with the scout have more to do with never having previously used biodiesel in it, and not having cleaned the tank and lines, and the years of petro diesel use. Frankly the first stop they made at the start the guy should have said something to them. Had the vehicle been properly prepared for the biodiesel, or had they been properly prepared to deal with the issue on the road (having lots of spare filters) it probably would have never made the blog. On the other hand not sure about comparing the scout to the Passat. I am pretty sure any attempt to actually camp in a Passat would have made for even more "interesting" blog entires than the fuel line problems.